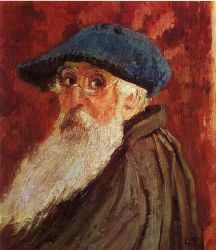 Jacob-Abraham-Camille Pissarro was born at Charlotte Amalie (St. Thomas), Virgin Islands, to Abraham Gabriel Pissarro, a Portuguese Sephardic Jew, and Rachel Manzano-Pomié, from the Dominican Republic. 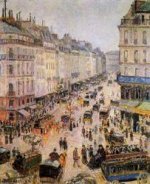 Pissarro lived in St. Thomas until age 12, when he went to a boarding school in Paris. He returned to St. Thomas where he drew in his free time. Pissarro was attracted to anarchism, an attraction that may have originated during his years in St. Thomas. In 1852, he traveled to Venezuela with the Danish artist Fritz Melbye. 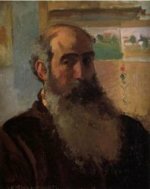 In 1855, Pissarro left for Paris, where he studied at various academic institutions (including the École des Beaux-Arts and Académie Suisse) and under a succession of masters such as Jean-Baptiste-Camille Corot, Gustave Courbet, and Charles-François Daubigny. Corot is sometimes considered Pissarro's most important early influence; Pissarro listed himself as Corot’s pupil in the catalogues to the 1864 and 1865 Paris Salons. His finest early works (See Jalais Hill, Pontoise, Metropolitan Museum of Art, New York) are characterized by a broadly painted (sometimes with palette knife) naturalism derived from Courbet, but with an incipient Impressionist palette. Pissarro married Julie Vellay, a maid in his mother's household. Of their eight children, one died at birth and one daughter died aged nine. The surviving children all painted, and Lucien, the oldest son, became a follower of William Morris.